San Francisco is a lovely place. It's a very lively city and we loved our time here. The cable cars that go up and down the steep streets were a highlight for us, because it's so unique and something we've always seen in the movies. On our first day, we hired bikes and cycled across the Golden Gate bridge and up a nasty steep hill, which turned out to be so worth the effort because we were rewarded with a stunning view of the city. We were told by some locals that it was the clearest day they had witnessed in San Francisco, so we felt very lucky. We continued to Sausilito, a lovely seaside town, where we had lunch before braving the steepest mountain we had ever cycled up to get to the Muir Woods. There were almost tears on the way up, because the hills just went on and on and on, but it's just as well we didn't know how bad the cycle was going to be, otherwise we would never have done it and we would never have experienced the Muir Woods in the next valley, which have the highest trees in the world. It was amazing to see all those redwood trees. The next day we visited Alcatraz, which was another highlight. 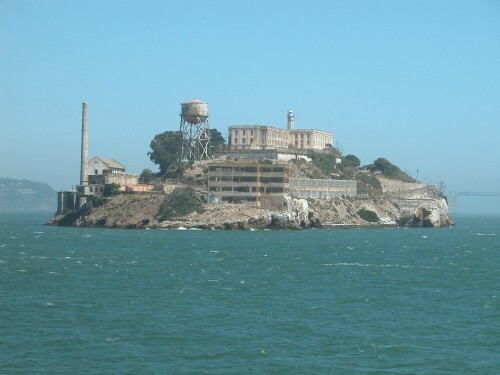 You can't actually believe how close the island is to the mainland and how the smells and sounds of "free life" across the waters must have tortured the inmates. We also really enjoyed walking around Fisherman's Wharf and ended the day with a lovely meal and then checked out the Starlight room which is a bar at the top of the Sir Francis Drake Hotel. It was great to see the city lights form there. I just have to write here "Mama said Mama said" so we can remember someone. Too much hassle to write down the details now but we've been laughing and laughing about it.